This post comes with a little bit of a back story. One, that made me very sceptical about trying it out. 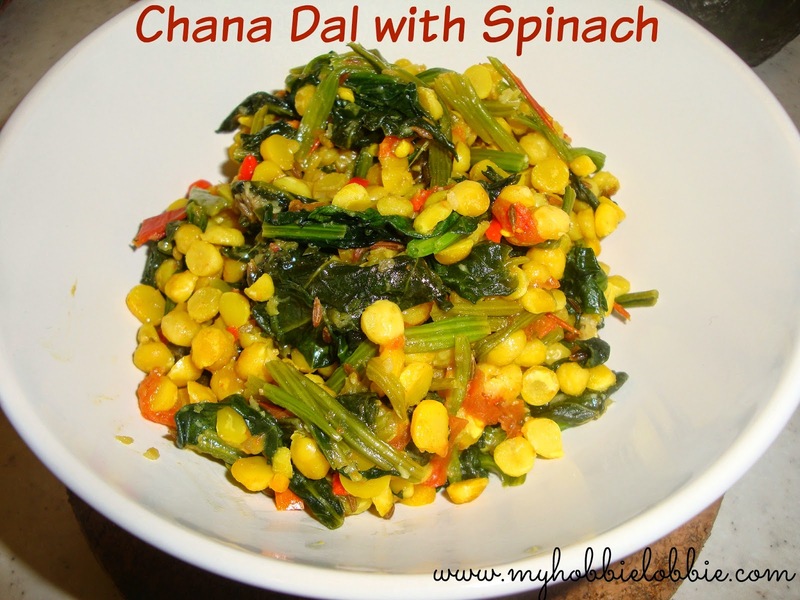 Back in the day when we stayed over at my in-laws place for a short while, a chana dal with spinach would ever so often appear in the dinner rotation. I usually am very tolerant with food and will eat anything gratefully. So, I somehow ate what was essentially a bland mash of spinach and chana dal. Not one of my favorite food memories. Turns out this dish used to be made very well by my late mother in law, but the gang hasn't been able to replicate or even come close to the dish she used to prepare. My husband often asked my to try it out. Between you and me, I was not very eager, after tasting the infamous mush. Eventually I gave in to his requests and decided to look online for a version that might appear like it would be better than what I'd had in the past. A recipe I found on Taste.com.au piqued my interest and I decided to give it a try. I am so glad that I did. My version is very loosely based on that recipe. The resulting chana dal with spinach is really good. It packs a good amount of flavour and textures and has worked its way into my heart and my dinner rotation. It is a simple dish and you can choose to serve it with some rotis / chapatis or as a side to your favourite meat dish. Wash the chana dal a couple of times in water and drain. Soak the chana dal for about an hour. Drain the water. Boil the chana dal in some fresh water (about 3 cups) and a tsp of salt. After it comes to a boil, reduce the heat and simmer for about 30 minutes. Cook the dal till it has softened but still has some bite to it. You DO NOT want a mush. Drain and reserve some of the liquids. Heat the ghee in a large pan over medium high heat. Add the curry leaves, garlic and cumin. Once the cumin sputters, add the ginger, chilli and turmeric and stir to mix well. Once the spices have turned fragrant and have mixed well (should take about a minute or so). Add the chopped tomato and stir. Cook for a couple of minutes, till the tomato softens and breaks down a little. Add the chopped spinach / baby spinach and stir it into the spices till it has just wilted. Add the drained chana dal and stir through. You can add a tablespoon or 2 of the reserved liquid, if you think it is too dry. You want the liquid to all mostly dry up. Add it one tbsp at a time. You just want enough liquid to help warm the dal through without burning. You may not need any of the liquid at all.